SIADH vs Diabetes Insipdius! Are you studying diabetes insipidus and SIADH and find it very confusing discerning between the two disease processes? You are not alone! In this article, I am going to easily break down the differences between diabetes insipidus (DI) and SIADH (Syndrome of Inappropriate Anti-diuretic Hormone). I addition, I provide a lecture on how to remember the differences between the two! 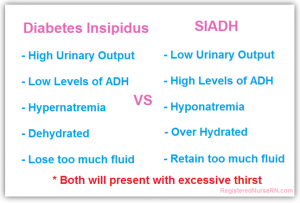 Don’t forget to take the SIADH vs Diabetes Insipidus Quiz. What is Diabetes Insipidus and SIADH? This is where the body has a problem producing ADH (either too much or not enough). What is ADH? It is anti-diuretic hormone. This hormone is produced in the hypothalamus, and stored and eventually released in the posterior pituitary gland. In order to understand diabetes insipidus and SIADH, you MUST understand how ADH works because ADH plays an important role in both DI an SIADH. Each condition is related the secretion of ADH (anti-diuretic hormone also called vasopressin) which plays a major role in how the body RETAINS water. Each condition presents oppositely of each other (ex: in SIADH the patient retains water vs. DI where the patient loses water)—-Remember they are opposite of each other! Diabetes Insipidus and Diabetes Mellitus are two separate conditions and are not related although they share the name “Diabetes”. How does the Anti-diuretic Hormone work? ADH is produced in the hypothalamus and secreted/stored by the posterior pituitary gland. The function of ADH is to cause the body to retain water and constrict blood vessels. How ADH cause the body to retain water? Through the help for the KIDNEYS! ADH causes the renal tubules to retain water (in a homeostatic way). ***But if you have too much ADH you will retain too much water and if you have too little ADH you will urinate all of the water our of your body! How to Remember which one is Increased vs Decreased? Hypertonic IV solutions (3% Saline) to remove fluid from the cell back into the vascular system so it can be urinated out (watch for causing fluid volume overload..give slowly and through central line per hospital protocol)****NOTE: Loop Diuretics & Hypertonic Solutions are usually order together. Declomycin (tetracycline family) ADH inhibitor and allow for diuresis…don’t give with calcium containing foods like milk or antacids because it affects absorption. 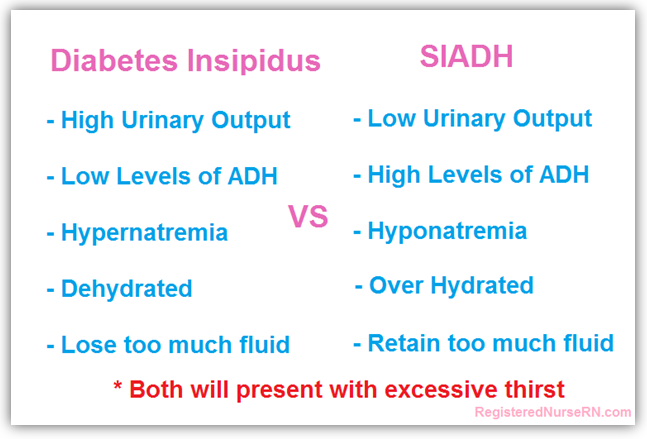 Still Confused on the Differences between Diabetes Insipidus & Syndrome of Inappropriate Antidiuretic Hormone (SIADH)? Here is a chart comparing the two. You can use this as a study aid in helping you remember. Sometimes, seeing the differences side by side between the two helps.